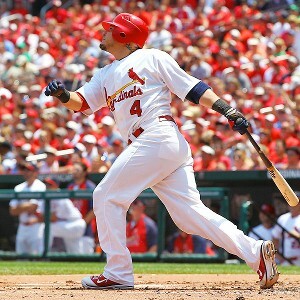 The St. Louis Cardinals have made a one-year, $14.1 million qualifying offer to free agent Carlos Beltran. They just don't expect him to return next season. St. Louis Cardinals catcher Yadier Molina expects to be in the lineup Thursday, the first day he's eligible to come off the 15-day disabled list from a right knee strain. He wants to play every day again, too. in their handling of Molina, who landed on the DL last week with inflammation in his knee. Things were looking so good for the St. Louis Cardinals last week, but now the losses are piling up. For one, the team has lost six consecutive games, including Tuesdays doubleheader sweep by the legitimate Pittsburgh Pirates. The St. Louis Cardinals welcomed Yadier Molina back to the lineup Tuesday after the All-Star catcher missed three games with what was diagnosed as right knee inflammation. The St. Louis Cardinals have traded struggling reliever Mitchell Boggs to Colorado for the Rockies' international signing bonus slot No. 4.